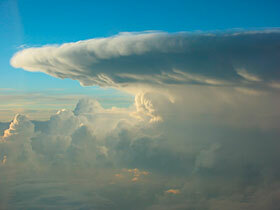 Sometimes, a very hazardous cell, such as you see here, seems to elude the radar during high-altitude cruise. This is due to simple physics. Commonly, the upper part of a thunderstorm is composed of very dry, frozen moisture and does not efficiently reflect radar energy. Equally confusing, these cells may be displayed on the radar at distances of say, 80 or 100 miles, but appear progressively weaker as they are approached until they finally disappear completely. This occurs at longer distances (with 0º tilt, as seen below) because the bottom of the beam is several thousand feet below cruising altitude and is reflecting off of the “wet” part of the cell, commonly the mid and lower areas. However, as the distance to the cell decreases, the bottom of the beam casts progressively higher and higher into the cell until the “radar top”—the top of the cell as detected by the radar—is exceeded. Now the beam is “over-scanning” the target, i.e. the beam of radar energy is focused above the radar top where the reflectivity value is below the minimum detectible threshold. So even though serious threats may exist, dry hail and turbulence for example, the radar provides little or no warning. ©2010 Radar Training International Inc.